Lori Darnell was born February 28, 1969 to Reggie & Esther Thomas. She is the youngest of 8 children. Lori first traveled to Haiti in July 1978 and has made hundreds of trips there since that time. In her child mind, it was an amazing world. She didn't really see all the poverty, the filth, the disease, the hunger. As she grew older, she began to see those things, but also saw the love, beauty and joy of the Haitian people & the beautiful island Haiti could be. Haiti became "home" to her. Lori spent many hours building and working at the Mapou Christian Orphanage. The children at the orphanage became her extended family. Most of her favorite memories of growing up took place during work trips to Haiti. In 1989, Reggie & Esther decided they needed to find someone else to direct the orphanage. After a few months of looking, they still couldn't find anyone to fill this position. Unbeknown to them Lori was praying about the situation, and shocked them by saying she wanted to direct the Mapou Orphanage. Things have definitely changed since that time! Because of circumstances beyond our control, Lori had the children & Prospere & his family move from Mapou Lagon, Haiti into Gonaives, Haiti. 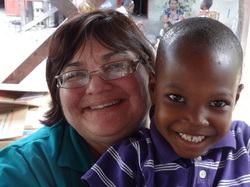 Lori also expanded the Orphanage Ministry from 1 orphanage in Haiti to currently 7 orphanages throughout the world. Lori also met her husband, Zane, while speaking about the orphanage at East Point Christian Church, East Point, Ga. They were married in November 1990 and even honeymooned in Haiti! They have one daughter, Lacey Anyssa, who is 20. Lacey first went to Haiti when she was 18 months old and loves going to Haiti & the people there every bit as much as Lori did. One of Lori's greatest joys is watching Lacey grow up in Haiti and the love she has for the children and the people of Haiti. We are working on our third generation of helping the people of Haiti. Lori also serves as the Office Administrator for White Fields. She is in the office every morning during the week. Lori is responsible for all the day to day activities of White Fields.